Earlier this year I attended the opening of Hana Shimada’s first solo jaunt, The Hana Shimada Show at Black & Blue gallery in Redfern. Only mildly aware of her work at the time, my mind was this night exposed to the weird and wonderful world of Hana’s pun filled imagination. Rich in satire with a heavy emphasis on comedy value, Hana’s pictures did then, and do now, excite me each time a new one comes around. 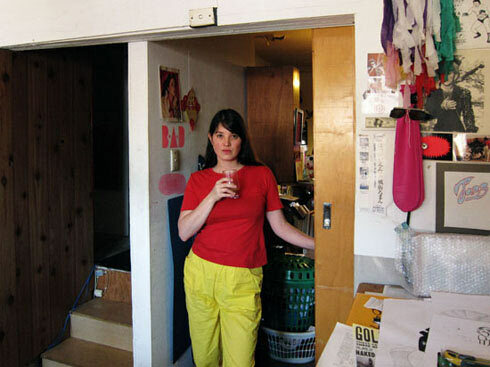 I caught up with Hana over an iced coffee at her home studio, Sydney, to talk about her art and guys who work behind the counter in kebab shops. Tristan Ceddia: How old were you when you started drawing? Hana Shimada: First drawings from age two my mum reckons. She told me she still has one she dated two years and 11 months I did of figures in 1978. TC: Did you wake up one day and decide to draw, or have things just worked out that way? HS: If you mean in terms of what has come to be the closest thing I have to an ongoing profession, I think that things have just turned out that way, yes. I majored in painting at university. For whatever reason I really choked up there. I was an earnest, cartilaginous tall-baby trying feebly to get the attention of a bunch of side-stepping, John Karandonis shoe-sporting, beard-wearing lecturers. I had a lot more fun in high school with making, I was a lot more fancy free, and so consequently I reckon I made better stuff at that time than I ever did at university. I probably did skill up a bit more at uni I guess, even if the outcomes were pretty stilted and unimaginitive. But majoring in painting and all that expensive expansive blank canvas really got me back onto the relative simplicity and immediacy of pens and pencils and paper. I got a scholarship to research traditional Japanese painting at a uni of fine art and music in Tokyo post my degree here, which I found out requires an even more convoluted set up. It involves using these rich pigments and bunny guts extract concoctions, like a black diamond version of tempera painting. I do like the ceremony of preparing for executing something though… like when you’re doing cooking preparations, or shining your boots before you head out. But if in that ceremony the original impetus for an idea becomes too scrutinised, I feel like I lose my way or thread, and that’s no good. But yeah, I wound up living in Japan for around six years and I guess that was where I started doing fun commercial illustration. Yet another great thing about that place is the lack of interest in the significance of doing fine art versus doing commercial art or design. So long as it’s interesting, it’s rated. I like to make things in general, and drawing is always a key part of that process even if the end product isn’t one, so yeah, it’s a big thing for me. TC: A few of your drawings reference the guy behind the counter at infamous Sydney kebab spot Fatimas. One of your drawings comes to mind where he has his arm around a mean looking tiger. What’s your obsession with drawing this guy? HS: Two drawings of Nada to date. I really like public postings of defining moment snaps and other nib-jibs of personal consequence. 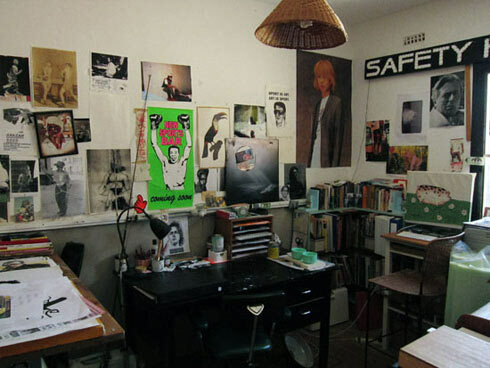 It’s a really nice invitation into the lives of the posters, and a warm territory marker. 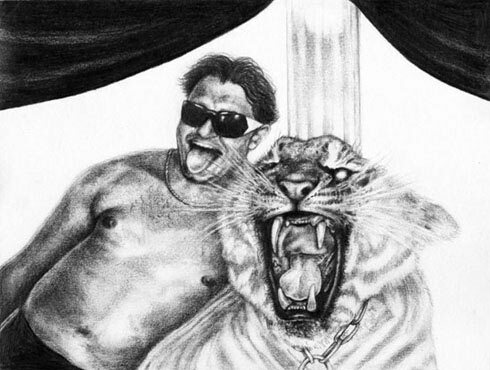 The tourist image of him with the tiger that I drew is quite remarkable because they are both wearing chains and bearing their teeth, needless to say for very different reasons. One bald, one haired. One wild, one acting wild. I just like his appearance. TC: You live and work quite close to Fatimas. Does this guy know he is a subject in your illustrations? HS: Yes. He knows. He’s been very accommodating of my arty requests. He even let me take some shots of his mug right out the front of Fatimas one day. I got right up in his face with the camera, and he was absolutely fine with it. I have given him prints of each of the drawings I have made starring him. He told me he was going to laminate them. 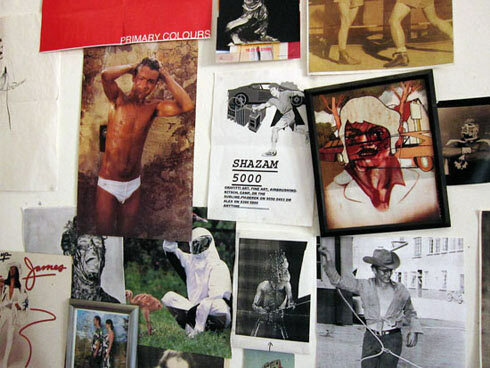 TC: Earlier this year you had your first solo show, The Hana Shimada Show at Black & Blue Gallery in Sydney. Had you exhibited much work prior to this? TC: One of your drawings was 238cm’s long and states ‘I KNOW WHAT YOU’RE TALKING ABOUT ‘CAUSE MY MUM’S A JPEG.’ What’s that all about? HS: I overheard the earnest empathetic response: “I know what you’re talking about ’cause my Mum’s a jpeg” when I was working part-time for the Department of Education and Training. The shortest amount of retrospect told me it was almost certainly a Mondegreen, and I was probably just entertaining myself in a dry environment. 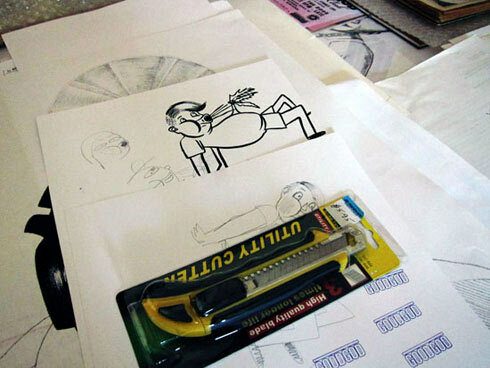 But anyhow, it made me really happy, and seemed to make a lot of sense to put alongside these drawings I had been making of the street press social page poser-snaps I had been scouring and cutting out and collecting for some months. The countless homages by the children to the children who had parted their peace fingers and poked tongues through before them, willingingly replicating impersonal stances ad nauseum. I liked thinking of these kids in these throw away shots as parents, and aunties, and well, I guess, all grown up, and even dead, and these images being the only or last representations of them. The quote made sense to draw as a plaque to emulate an epitaph’s treasuring and wrapping up of a life. TC: You also had some ‘Light Entertainment;’ a piece built out of lights reading ‘OH HOW I ENJOY THE LIGHT.’ What do you enjoy so much about the light? HS: Light is crucial for keeping on top of one’s self. It is also crucial for enjoying many things in life like that involve seeing and making. TC: You celebrated the 12″ format in your show with LP size artworks. Do you find this format favourable? HS: Yes. I think there are few better thought out designs. You have a card square consummately scaled for human enjoyment/engagement with a perfect circle for sound inside. Typography and imagery in this format is imbued with sonic potential. Classic. TC: You have illustrated record covers for record companies including Modular and BangGang 12s. Do you do much commission work? HS: Bits and pieces. Most often I am given free reign over what I make for clients, which is nice, and fraught. A tee design I did for excellent young label to watch run outta Brooklyn by Dre Skull “MIXPAK” just dropped! HS: Yes, it is great. Those guys really let me throw my creative weight around. It’s always been important to me to have a creative presence in my community and locally, and GoodGod Small Club night spot is such a righteous mission to be channelling that into. It’s a privilege to be in constant collaboration with wonderful and tireless people that value and understand the potency of detail, and who reckon the nurturing of community and culture is worth making a fuss about. I think the night club is about providing a safe and fun face full haven in this town for bolstering excellent music, and providing a space for varietal projects to be aired. The high pressure turn around time on making posters is great for my exxxtreme design training too. Churning and being happy with results is pretty euphoric. TC: I’ve seen you playing records dressed as… what’s the name of that clown dog character? What’s the story there? HS: Flanky. Yeah, he’s a dog clown! My friend Matthew had a clown party for his 30th birthday four years ago. That was the first time I clowned, and I liked it straight away. I felt this immediate rapport with myself as clown… it’s so interesting what losing the weighting properties of your eyebrows and plonking some shapes down on your base face can do. You can really disappear, but your face is still hanging out there in the wind! Revelatory! Flanky has the same taste as me in just about everything, but he doesn’t heed social conventions or niceties (unless he is getting paid). He is a collapsing inward drunk and a chain smoker.